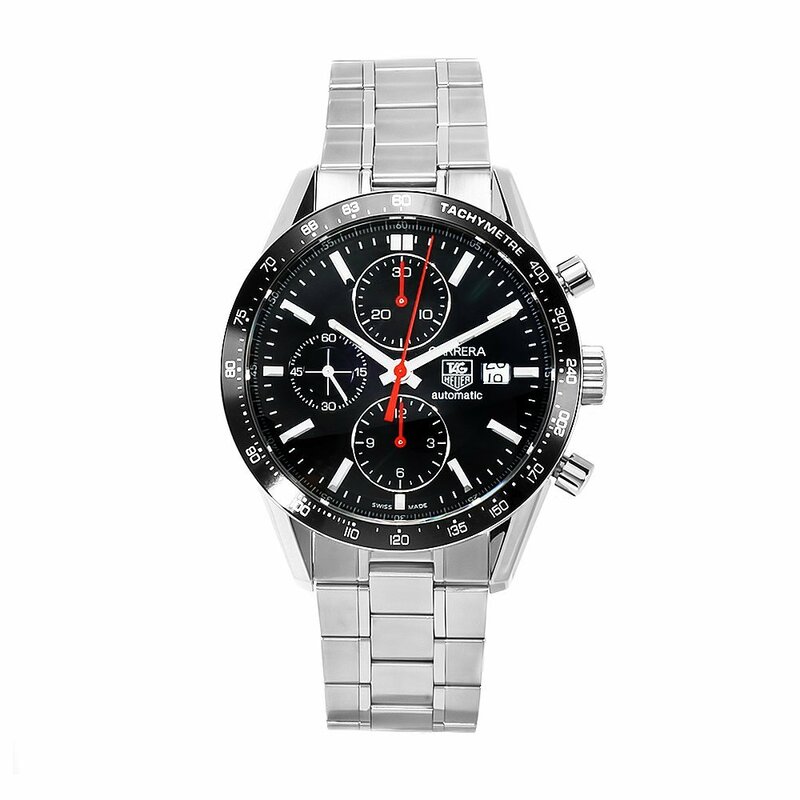 The feature rich automatic self winding men’s TAG Heuer Carrera black chronograph CV2014.BA0794 has a stainless steel 41 mm case with a black aluminum functional tachymeter bezel and a skeletal backing. The band is also stainless steel and has a width of 20 mm and is secured by a double push button fold over clasp. The black analog guilloche dial features three sub dials – 60 seconds, 30 minutes, 12 hours – and a date window at the 3:00 position. The luminescent markers and minute and hour hands are protected by a anti-reflective scratch resistant sapphire crystal.This Swiss made watch is water resistant to 165 feet. 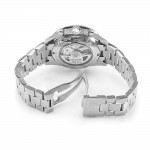 This is a very manly watch, hanging strongly on the side of practicality over jewelry. The large three link strap and reliable deployment style clasp along with the 41 mm case exudes the kind of class one might find on a 50’s era Pan Am pilot or anyone with a sail boat. It’s big at nearly two pounds, it’s shiny with all that polished stainless steel, but not gaudy using contrasting black aluminum for the tachymeter bezel. This watch is purely functional. The skeleton backing is not necessary and can only be amusing to the wearer when not wearing it. A questionable design choice, certainly not a selling point but by no means a deficiency in craftsmanship. Overall this watch is very attractive and comes from TAG Heuer. Expect excellence from this timepiece. It’s an expensive watch sure, but it makes for a great retirement gift. Sticking to the current theme imagine, if you will, a Mad Men-esque office party celebrating the illustrious career of a long time executive. This is the kind of watch I see being given to said retiree from the company, perhaps with some kind of clever or snide remark etched into the solid portion of the skeletal backing to the case. "You're old now, thanks for spending so much of your life here!" Or something like that. I don't know what people say, I've never retired. Not to cause confusion, this TAG Heuer Carrera has a very modern design. This is not a retro stylized watch but the design does go back to basics somewhat. Focusing primarily on the function of the watch while maintaining a solid look eludes a kind of throwback to a more traditional watch making strategy. From online retailers this watch is available at the steep price of around $2,500, but one might be hard pressed to find a comparable watch for a better price. I can’t emphasize enough how delightful a gift this watch would make. This is a classic model of TAG Heuer company, I like this style very much. As I known, many people like this model.